I had Elsa and Anna for my daughter's 3rd birthday. They were amazing. They stayed in character the whole time. I cannot thank them enough. My daughter was so happy the entire time. I will definitely book this company for future events. Rapunzel was amazing! She was very friendly and great with the kids. My 4 year old daughter and her friends had such an amazing time. Rapunzel painted their faces, did their nails, and played games and danced with them. I can't believe how much she accomplished in one hour. Thank you for making my daughter's birthday so special! We were lucky enough to have a visit from the tooth fairy today at our preschool! She was on time, super enthusiastic, and the kids just loved her! I will definitely be using this company again for our party needs! Elsa and Anna were so amazing! I just left a review on your Facebook page, but felt like that didn't suffice. I have hired from other companies in the past and was left disappointed. I'm so happy that wasn't the case today!!! I can't express how amazing these ladies are!!! They did everything plus more and it exceeded our expectations. My daughter has a great memory and I know she will cherish these memories for a life time! Thank you for making that possible! I will highly recommend them to anyone. Elsa and Anna were unbelievably AMAZING!!!! I am highly impressed with how in character they were from start to finish and it felt as if we had the real Frozen sisters in our house!!! Everything they did was perfect from the engaging story-time (love the layout and follow up questions) to the fun dance party, "Freeze Dance." My daughter asked them several questions, and these ladies were on their game! Thank you so much for making my sweet Harmony's day SUPER SPECIAL!! She loved taking silly pictures with you two and having you ladies sing her, "Happy Birthday!" Highly Recommend over any other company we have tried! I had Ariel join my daughters birthday party on the 17th this month and I just wanted to take the time to say how absolutely wonderful she was! She was in character with every word and story she told. It was the most perfect experience and my daughter will have such wonderful memories from that day. Your company was my first choice by all the things i saw on your website and I was not disappointed one bit. I just wanted to say thank you and what a wonderful experience this was! Hi Emily! I would love to leave a review for Anna and Elsa. They were over-the-top amazing and completely exceeded our expectations! The singing was priceless! We will remember this day forever. :-) thank you so much. Moana was fantastic! The kids were enamored with her and she made the experience special for each one. Thank you for being a part of our program and I definitely hope to use your business again in the future. I just wanted to take a minute to let you know how fantastic Poppy was at our party this weekend. She arrived right on time and was a big hit the minute she walked in the door. We had a large group of kids, but she was able to handle them very well and she fit in all the requested activities during her hour at the party. She was excellent with the children and we could not be more pleased with her. She was very friendly and professional and did a great job engaging with the children. Thank you for making our party such a huge success! Thanks again. Thank you for such a wonderful experience! Anna and Elsa were AMAZING! I fee like I met the real frozen sisters. My daughter was so excited and the kids all had a wonderful time! I will definitely be using you guys again! I just wanted to drop you a quick note and tell you how AMAZING our Arianna's birthday party was on Saturday. 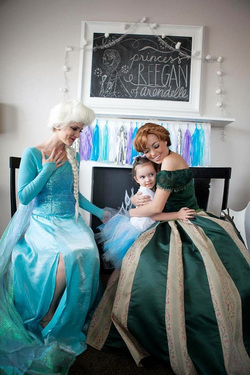 She was SO surprised that Queen Elsa and Princess Anna came to her party! Her face was just priceless when she saw them! The ladies were absolutely magical! Everyone was in awe of the way they never broke character and the way the interacted with each child. They are fantastic! Please let them know again how much we loved them. Wow! I absolutely loved Ariel today at my daughters party! Not only did she play the role perfectly she was amazingly sweet and believable. I am truly pleased as were the kids and all of the parents! I Highly recommend hiring them!!!! They seem to really take time and cast their princesses well. Ariel surpassed my expectations for our daughter's 5th birthday party! "Rapunzel came to our house for our daughter's 2 year old's birthday party! It was a magical day! Fairytale Events Rocks!" ​Copyright © Fairytale Events LLC.